This is a book I’ve been looking forward to for some time. Novels are so often described as epics – it’s come to be a wearisome cliché – but it was a perfect fit for Burnt Shadows, Kamila Shamsie’s last novel which followed twenty-one-year-old Hiroko Tanaka from the immediate aftermath of Nagasaki in 1945 to Guantanomo Bay. Beautifully written, engrossing and peopled with characters who make the universal personal, it’s a towering achievement. So you can see why my hopes were high. Shamsie’s new novel opens in July 1914. Twenty-one-year-old Vivian Spencer is working as an archaeologist, a few steps on from Sarah Moss’s Ally in my Bodies of Light post but still not able to vote. She is entranced by the story of Scylax, despatched to explore beyond the edge of the ancient world and given a delicately wrought silver circlet by his patron. When the excavation team returns to Europe, they find that war has broken out. A year later, exhausted by her experiences as a VAD, Vivian longs to go to Peshawar where Scylax went before her. Arrangements are made. She travels alone meeting a young Pashtun along the way. Qayyum Gul lost an eye at Ypres fighting in the British Indian Army and is returning home. The narratives of these two are interwoven as Vivian, befriended by Najeeb a bright young boy and brother to Qayyum, continues her research while teaching Najeeb Peshawar’s history. By April 1930, Najeeb has become Peshawar’s museum assistant, Vivian has returned intrigued by his insistence that the longed for circlet is to be found there and Qayyum is active in the Khudai Khidmatgar, a non-violent resistance movement. Slowly drawing her readers into the lives of these three characters – their experiences of war and of empire – Shamise builds towards the climax of her novel: the massacre of April 23, 1930 in Peshawar’s Qissa Khwani Bazaar, the storyteller’s market, a shameful episode in British history. Just as she did with Burnt Shadows, Shamsie takes complex universal themes and humanises them through the lives, loves and passions of her characters. Vivian nurses war casualties with a stoic horror which comes close to breaking her. She slides into betrayal trying to please the father who would rather have had a son. Qayyum suffers a confusion of loyalty and antipathy when his dearest friend calls him to violent resistance. His feelings of camaraderie with British soldiers which outweigh those for his fellow Pashtuns seem at odds with his growing resentment of the Empire and its assumed superiority. Shamsie’s writing is gorgeous – the descriptions of Peshawar are evocative of heat, light, fragrance and beauty. It’s a city of stories – one in which a young woman handing out water to the protesters is transformed into an angel surrounded by glorious light – and this is a novel of stories, each one as powerful as the next. Its climax is both vivid and page-turning – the confusion and mayhem when peaceful protest becomes a massacre, powerfully portrayed. If you’re still wondering, my expectations were more than met: it’s a very fine novel indeed. That’s it from me for a week or so. I’m off to Madrid which I hope will be as sunny as it has been here in the UK recently. Happy reading! 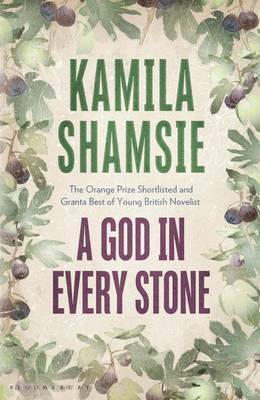 This entry was posted in Reviews and tagged A God in Every Stone, Bloomsbury Books, British India, Fiction, Kamila Shamsie, Pakistan, Peshawar on 20 April 2014 by Susan Osborne. Pleased to discover this author and looking forward to reading one of her books. I hope you enjoy them as much as I did, Claire. I am sure I will, always enjoy that cross cultural perspective and have been reading a few interviews and features by and about her. Reminds me a little of Aminatta Forna. Have a wonderful holiday. This writer is completely new to me but the book sounds like one I would really enjoy and what’s more one a friend with a birthday at the beginning of May would like as well. Thank you. Thanks, Alex, it was lovely. A beautifully green city although what it looks like in their 40 degree summers is hard to imagine. I hope you give Shamsie a try. Burnt Shadows would be a very good place to start. I loved this too – although not quite as much as Burnt Shadows which I thought was just so brilliant that it really stayed with me. Still A God in Every Stone is wonderful and I really hope it does well – I have a feeling it will. I was relieved that it was so good, Ali. Nothing worse that being disappointed by a favourite author although I think you may be right – Burnt Shadows will probably stay with me longer. I still have her last book, and as I’ve loved her earlier books and I’ve read such praise for this one I really should pick it up. Definitely didn’t disappoint, Fleur, much to my relief. She writes beautifully, doesn’t she.